Specna Arms is planning to expand its offer of airsoft replicas with brand new models of airsoft sniper rifles! We don’t know the release date however, we got a sneak peek of major features. 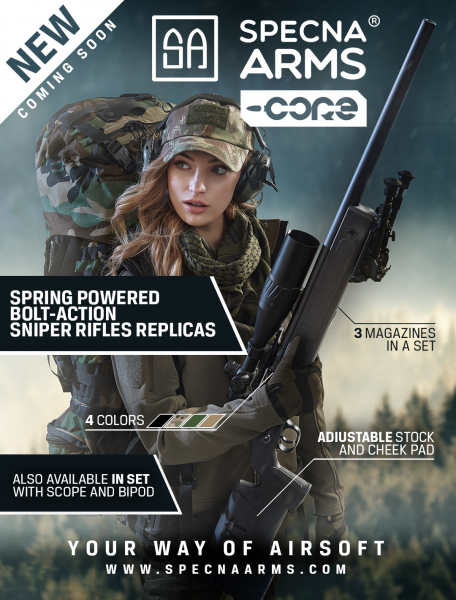 The SA-S02 and SA-S03 spring-powered models will be part of the CORE series which is known to airsoft players for its great price/quality ratio. The stock of the replica is made of high-quality, nylon fiber reinforced polymer. It will be available in four color versions, including one camouflage pattern. Furthermore, to provide better grip, some parts like the pistol grip have grained textures. Other components such as the barrel or breechlock with trigger are made of metal. The rifle is equipped with two RIS mounting rails: 22 mm rail for optical sights and under rail for other accessories. Thanks to the adjustable stock and cheek pad shooter can adapt the replica to his body type and preferences. The set includes three magazines. The manufacturer informed us that the new replica will be sold separately or in the set with additional accessories like scope or bipod. We are still waiting for more information on this promising airsoft sniper rifle. Meanwhile, feel free to check out first pictures of new products from the Specna Arms family. Which brand comes to mind first when you think of Airsoft?